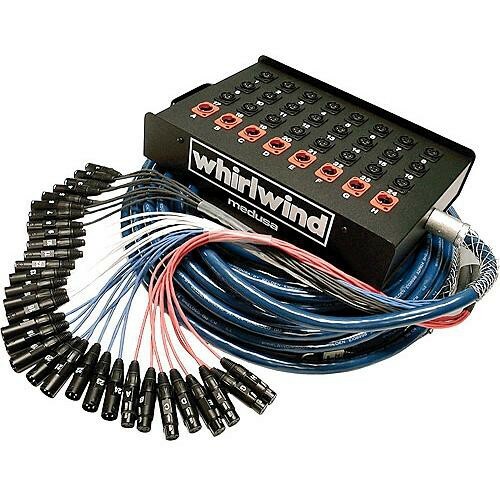 This Whirlwind Medusa Standard 32x XLR Send/10x XLR Return Stagebox to Fanout Snake (250') is a snake cable with a heavy-duty powder-coated steel stagebox at one end and a fanout at the other end. The cabling consists of heavy-duty, flexible Belden NEC CM-rated multi-pair cable. Each pair contains 2 twisted 24GA 7x32 polyethylene-insulated conductors with 100% foil shielding and 24GA drain wires. Box Dimensions (LxWxH) 31.0 x 23.0 x 22.0"